By any definition, Gwen Pearson is pretty smart. She’s got a Ph.D in entomology from North Carolina State University and she is now a science writer and education coordinator at Purdue University. But she remembers how often she was told she wasn’t good enough, simply because she was female. “As a graduate student, a fellow male student said, to my face, that he had no idea how I was admitted to the program because I clearly wasn't smart enough to be there,” Pearson recalls. Women in science, technology, engineering and math (STEM) careers have countless similar stories. A new study published Wednesday adds to a growing body of hard evidence to back up those stories. It finds that men in STEM subject areas overestimate their own intelligence and credentials, underestimate the abilities of female colleagues, and that as a result, women themselves doubt their abilities — even when hard evidence such as grades say otherwise. 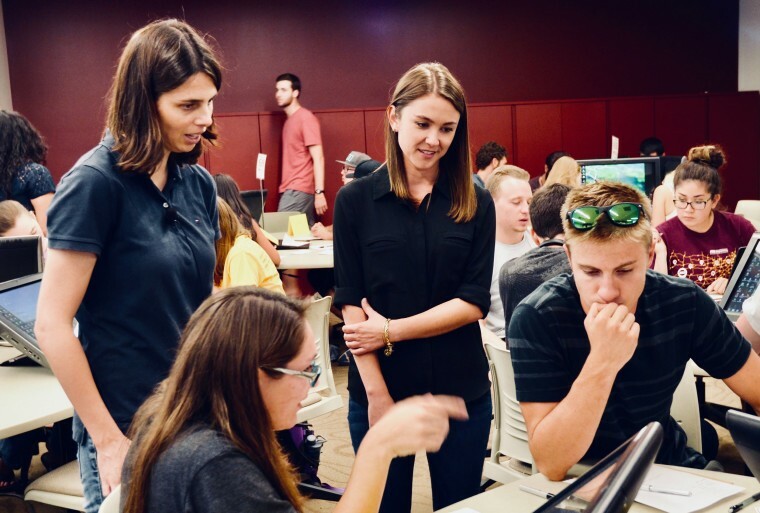 Katelyn Cooper, a doctoral student in the Arizona State University School of Life Sciences and her adviser, assistant professor Sara Brownell, studied the effect in an undergraduate biology class. The average grade in the class was a 3.3. But when they asked students to ask if they were smarter than their classmates, "the average male student thinks he is smarter than 66 percent of the class, while the average female student thinks she is smarter than 54 percent of the class," Brownell said. Statistically, about half of people in any group should be above the average, and half below it. The students worked in groups and as partners and when asked to rate themselves compared to their closest workmate, the men thought they'd be smarter than 61 percent of their colleagues. Women put the number closer to 33 percent. “This echoes what has been previously shown in the literature; a review of nearly 20 published papers on self-estimated intelligence concluded that men rate themselves higher than women on self-estimated intelligence,” Cooper and Brownell wrote in their report, published in Advances in Physiology Education. “More and more of these studies are painting similar pictures,” Brownell said. “Females are not participating as much in science class. They are not raising their hands and answering questions.” It’s not that they are less able, but that they see themselves as less able — and so do their teachers, classmates and, eventually, employers. It’s no secret that STEM is dominated by men, and that for decades educators, medical professionals and the general public believed that males were somehow more adept at math, science and similar subjects. The notion has been disproved, but the attitudes persist, Cooper and Brownell said. Women in STEM fields report a persistent hostile atmosphere fueled by the belief that they do not belong. Cooper and Brownell said their experiment is notable because it took place in a biology class. “Unlike the more male-dominated fields like engineering and physics, biology is seen as a safe place for women,” Brownell said. Ilana Seidel Horn, a professor of mathematics education at Vanderbilt University, says it’s been shown that girls and women doubt their own mastery of a subject more than boys and men do. “Really bright girls often don’t feel like they know something unless they very much understand it, whereas boys are more comfortable saying they understand something without having an actual deeper understanding,” Horn said. Teaching methods, especially in mathematics, reinforce this. Success doesn’t necessarily require a deeper understanding, and this can frustrate men and women alike who want to really understand why a formula works, Horn said. “What helped me was understanding that my way of learning wasn’t worse. It was just different,” said Horn, who said she was often the only female in an advanced mathematics class. The attitudes do not stay inside people’s heads. Pearson said she felt the disdain of her male classmates regularly. “I can't even tell you how many of my early successes (awards and grants) were attributed to my being the only girl, and ‘they had to’ give the award to a woman,” Pearson said. Even the most confident girl or woman might begin to doubt herself when confronted with such attitudes from fellow students, teachers and colleagues, Brownell said. “I had someone take my photo off the departmental board and write ‘boy are you ugly’ on the back,” Pearson recalls. “I have a fair idea who did these things; and I suspect they thought they were being funny. What I really heard though was ‘You Are Not One Of Us’,” she wrote. “I had someone take my photo off the departmental board and write ‘boy are you ugly’ on the back." “It’s probably a bunch of little cuts,” Brownell said. “One of these events probably isn’t what stops someone from going on into science.” But they add up. That can scare off girls, and many boys, as well. What helps? Having a mentor, said Horn. “Finding people in authority who can support your own sense of confidence and validate your way of learning,” she said. And speaking up helps, too. Cooper recalls a seminar where she made important points, which were echoed, in louder and more confident voices, by men in the audience. They got the credit for her ideas. “I needed to think more confidently about how I present myself, so that those ideas don’t get attributed to another person,” Cooper said. Pearson has started an anti-bullying network in her field, called EntoAllies, to help not just women but also professionals and students from ethnic minorities. Brownell said teachers and professors need to take these differences into account, also. “We encourage them to be explicit about the importance of hearing from every student,” she said.